"Dr. Hirani restored my well being. Her holistic approach to diagnoses and treatment proved effective across a spectrum of issues where other treatments had failed. Dr. Hirani brought me relief from severe fatigue and apathy, mitigated hormone imbalances, alleviated back pain due to spinal stenosis, and recommended a diet on which I was able to lose weight and lower my cholesterol. I feel happier and more energetic now, in my early 50s, then when I came to see Dr. Hirani in my mid-forties." "I particularly appreciate Dr. Hirani's attentive listening, which is something that I have not always experienced in encounters with members of her profession. Further, I'm impressed that her goal is to keep me well rather than fix me after I get sick! I think she's got the right focus, and recommend her to others without hesitation." "If it were not for Dr. Hirani, my family and I believe that I might not be here today. I was afraid to go to sleep at night, thinking that I may not wake up and the possibility that my daughter would find me. No one knew what was causing my severe health problems however, most of them were not looking any further either or did not know where to look for answers. That is when I tried The Wellness Center and Dr. Hirani. I feel absolutely wonderful compared to a year and a half ago. I smile now and that was something that I did not do for years. My cardiologist actually called Dr. Hirani to find out what she had done to his patient - he could not believe the difference in me and was amazed. Dr. Hirani expressed to me that she had never had a patient with my problems before and that she would do her very best in treating me and further research my problems. She has satisfied my mother in the way she has treated me and that is very hard to do. I thank you Dr. Hirani from the bottom of my heart!" "At the time that I visited Dr. Hirani at the Rose Wellness Center, I suffered from constant nausea, headaches, faintness and exhaustion. I was unable to digest even the smallest meals; I would be extremely tired all day but could not sleep at night. I had seen several specialists and undergone many diagnostic tests, but no one was able to find cause or cure for my complaints. After my first visit with Dr. Hirani, she was able to connect my most severe symptoms with several other smaller problems I'd been experiencing and diagnose me correctly with Adrenal Gland Exhaustion. She prescribed enzymes and bovine hormones, along with diet and lifestyle adjustments, and I was symptom free within the year. After suffering for almost 4 years from this very limiting condition, I cannot tell you how much of a relief it was to finally be able to do something as simple as digest a meal or fall asleep at a reasonable hour. I was so grateful and very impressed with Dr. Hirani and have been referring people to her en masse ever since." 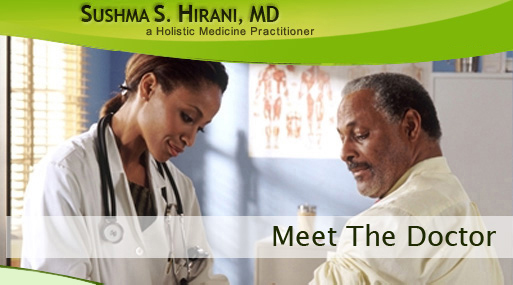 "Dr. Hirani has been my holistic doctor for over a year now. I was in very bad shape, overweight, depressed, eating disorder, high cholesterol, very high triglyceride, low HDL, high BP, insomnia etc. I have been seeing my regular family care doctor and specialist for over the years and the only solution they knew is to put me through life long medication, which has several side effects. I did not want to take the medications knowing their side effect, that time I decided I needed to do something different and wanted to take care of myself. I found Dr. Hirani from internet and just like other doctors wanted to give her a try. Dr. Hirani's first appointment was about two hours long, she explained about herself, her approach and then in detailed discussed each and every problem. For some reason I felt she is the right doctor for me, the treatment is not easy, but I had full faith in Dr. Hirani and I followed her advice to change my diet, regular exercise/ relaxation, and her supplement plan. Within 3 months I lost 35 lbs and after 6 months of the treatment my depression was completely gone, I eat healthy food; my cholesterol and high triglyceride are in normal limits. My HDL has "increased" and yes, it is increased to 51 from 34. My BP is now perfect. I am getting sound sleep. I would like to thank Dr. Hirani to help the community through her medical expertise." "After trying several endocrinologists and primary care doctors, I was frustrated and unsatisfied with my doctors' approaches. They wanted to mask symptoms with prescriptions rather than fix the cause. My first appointment with Dr. Hirani a few years ago was a completely refreshing experience. After discussing symptoms, she creates a wellness plan of supplements and any food changes. Labs will indicate if adjustments are needed. She works with you, guiding you toward your health goals, scientifically and with encouraging support! Thank you, Dr. Hirani!" "I've been a patient of Dr. Hirani for over five years now, and she now sees my entire family and lots of my friends! I am always impressed by her breadth of knowledge and calm, engaging demeanor. When I'm in her office, she is concentrating only on me, and I never feel rushed or dismissed as I have with other physicians. Even though she is foremost a holistic practitioner, she doesn't hesitate to utilize antibiotics or painkillers when the situation warrants them, but her expertise with natural hormones proved invaluable in helping me survive a miserable menopause. I feel very lucky to have found her!" "It would not be an exaggeration to say you have changed my life. Nine months ago I came to you suffering from insomnia, night sweats, and panic attacks so severe, they left my shirts drenched. Main stream medicine's solution to the insomnia was Ambien, which made me sleep, but had serious side effects, and resulted in me still being tired after awakening. Today, thanks to your assistance, I am sleeping well, and wake up rested. My night sweats are almost non existent, and the panic attacks are gone. I feel better now, at age 63, than I have for over 6 years." "I just don't know what my life would be like if I hadn't had the good fortune to have you in it. I met you at a crucial time in my life when in terms of my health I had hit a wall. My journey back began with you. Your generosity with your time and your clam and caring demeanor encouraged me to trust that you really care about me as an individual. Your knowledge of both traditional medicine and alternative medicine wisely guided me back to health and balance. Since I have been in your care I have learned about better eating, I have learn to listen to my body, and I have internalized good habits. I can never thank you enough."